This 10 month online certification program is designed for emerging leaders, intrapreneurs and career changers deeply passionate about making a positive impact through all that they do. We provide content and provocation to help you establish your facilitation and leadership skills. This program offers advanced training in the Disruptive Design Method and is perfect for people wanting to drive change within an organization or wanting to solidify their career as a leader in this space. We designed the UnSchool UnMasters in Creative Change-Making because we believe that every organization should have a professional Change-Maker role as part of its core leadership team. Leaders with a creative systems thinking mindset to help transform old linear ways of thinking that prevent transformative change, with a sustainability focus to ensure longevity and ethics in programs and processes and reflexive, critical brain power to develop new solutions to tired problems that no longer work. This program is designed for aspirational leaders who want to establish themselves as a creative force for positive impact. The UnMasters program is for emerging leaders, intrapreneurs and career changers who are deeply passionate about making a real and significant change either within an organization or in the world at large. This is a 10 month part-time program that delivers monthly content around the Disruptive Design Method, agency development, facilitation, leadership, community engagement, systems thinking, reflexivity and positive impact. The first 6 months are broken down into monthly knowledge acquisition sections around the core DDM knowledge bank, leadership development. There are quarterly checkins with our team and the last 3 months are dedicated mentorship to support your learning advancement and get you ready for your final certification challenge. Certification as an UnMasters give you the ability to demonstrate your commitment to creative change and your role as a leader in this space. You will have advanced communication, reflexivity, systems thinking and facilitation skills, supporting you in sifting to a career in positive impact or further developing your role in this space. This is a 10 month program with weekly sessions delivered monthly. Online, self-directed learning with pre-recorded lessons and involves preliminary and final challenges. After the completion of the program track, you will have 5 months to submit your final challenge. This program includes a 3-month mentorship with an UnSchool Educator. The UnMasters track is perfect for career changers or people working internally within organisation to facilitate change. The Educator track is for people who have already established their career, have done the DDM or projects in creative change, and are looking to expand their change making external to their organisation, and in collaboration with the UnSchool. This is self directed learning but you can always sign up for additional office hours to get one on one time with our UnSchool educators to support your learning process. Yes! You can get a free sample of some of the weekly classes. If you sign up and don't feel it's the right fit for you, we will issue a refund for your first month's payment if you let us know within the first 25 days. We offer the certification to demonstrate you have completed our UnMasters program and demonstrated a high level of capabilities as a practice of the disruptive Design Method and facilitating systems-level change. Certification is only awarded once you submit and successfully complete the required challenge pack and demonstrate your capabilities in a final review. 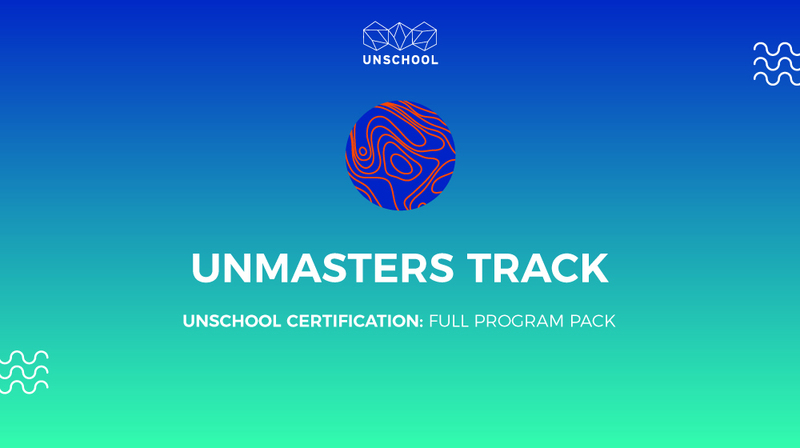 You will then be awarded a certificate and digital badge demonstrating your certification with the UnSchool. Please read our terms and conditions for full details on this track.